FA: Bryan Law et al, August 2007. After a short approach to the start ledge, Plutonics heads up a technical slab to endless slab and knob climbing. A bit runout in spots. Long first pitch. The second pitch is easier but runout, and the final pitch is very easy. 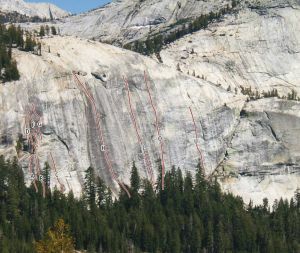 The final rappel is 210 feet to the ground or 200 feet to the ledge just above ground. Which SuperTopo guidebooks include a topo for Plutonics?